When you lose a tooth or several teeth to decay, disease, or trauma, you need to arrange for tooth replacement as soon as possible. Not only will this give you a more attractive smile, it will help to preserve your oral health as well. If the gaps in your mouth remain long enough, your remaining teeth can shift towards them and affect your alignment. Your dental bone could start weakening as well. For many decades, replacing missing teeth with removable dentures was your only option. Unfortunately, people had many complaints about them. The most common ones include that the dentures fit too loosely in the mouth, cause facial sagging, require special cleaning, and wearing dentures restricts food choices. A loose fit can cause the dentures to fall out when you cough, laugh, sneeze, or yawn, making for a very embarrassing situation. Dental implants allow you to avoid these issues while still restoring your missing teeth. They look and function just like your natural teeth and restore your mouth to full functionality. You can opt to receive dental implants instead of dentures or dental bridges if you’re missing one tooth, several consecutive teeth located on the same arch, or all of your natural teeth. Dr. Hanson or Dr. Osmundson will let you know if you’re a good candidate for this procedure when you come in for your initial consultation. 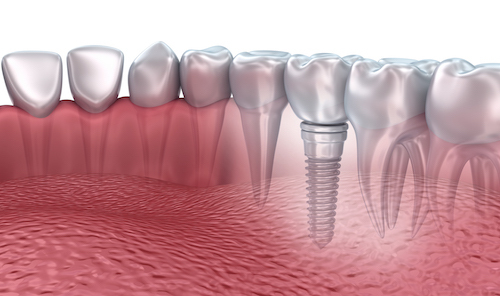 One of the major benefits of dental implants is that they provide you with new roots as well as replacement teeth. The artificial roots, called abutments, resemble a tiny screw. Your dentist installs the abutments in your jaw with a dental drill. You then need to wait up to several months for your jaw to heal and for the artificial roots to integrate with existing bone. The name of this process is osseointegration. You will come to Hanson Dental for periodic checks of your progress after your dentist completes the first phase. The final step is for Dr. Hanson or Dr. Osmundson to attach each replacement tooth to its abutment. You leave our office with natural-looking, non-removable teeth that will immediately improve your smile. We understand that you don’t want to have a gap in your smile or no teeth at all for several months, which is why we fit you with fit temporary dentures while you wait for healing and osseointegration to take place. Schedule your consultation today to learn more about how dental implants are the next best thing to having your own natural teeth.